TransAfrica was organized on July 1, 1977, as a non-profit organization that sought to give aid to predominantly black nations. Any concerns that dealt with the economy, politics, and society in nations, including Africa, the Caribbean, and Latin America, were monitored by the organization. It especially pooled its efforts against the apartheid in Africa, initiating letter-writing campaigns, hunger strikes, and protest marches. Randall Robinson, the executive director, Herschelle Challenor, and Willard Johnson, created the foundation of the organization and were the main figures who guided TransAfrica. The organization’s goal to help those nations varied from taking legal actions to raising the awareness of people around the world. In 1984, during the Reagan Administration, Robinson and other supporters founded the Free South Africa Movement, which resulted in over 5,000 people being arrested for protesting in front of the South African Embassy. Then in 1986, President Reagan, known for his support of the apartheid, had his veto of the Anti-Apartheid Act overturned, which resulted in the law of imposing economic sanctions on South Africa to pass. In 1991, with the military overthrow of the President of Haiti, Randall Robinson went on a hunger strike in 1994, protesting against Clinton’s policy of forcibly returning Haitian refugees to their country. At the same time as the incident in Haiti, Nigeria, too, was suffering from a military leader, who oppressed those who were pro-democracy. Haiti’s president was restored three years after the coup, while TransAfrica pushed for democratic reforms in Nigeria until 1999. 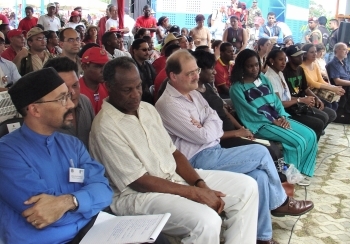 More recently, now called the TransAfrica Forum, has focused on creating a cooperative body of peoples, coming from oppressed countries and educating them on the policies and news of their respective, as well as each other’s nations. The financial burden crippling most of these countries are also addressed. The organization promotes human rights and fair trade as opposed to the militarization and resource extraction as the answer to the growth of these nations. http://www.transafricaforum.org/; Randall Robinson, South Africa and the United States: the declassified history (New York: New Press: W.W. Norton, 1993); Nina Mjagkij, Organizing Black America: An Encyclopedia of African American Associations (New York: Garland Publishing, Inc., 2001).